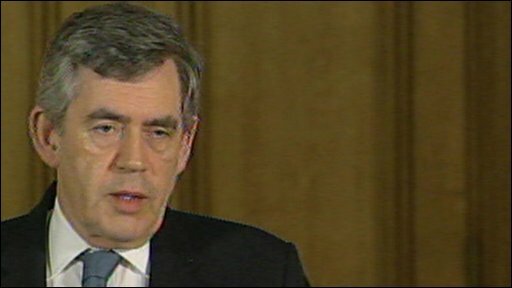 Prime Minister Gordon Brown has firmly rejected claims he "bought" victory in a Commons vote on terror detention. Labour rebels, Tories and Lib Dems looked set to defeat the plan - but it got through by 315 to 306 votes after nine Democratic Unionist MPs backed it. Opponents claim Mr Brown swayed the DUP with extra cash for Northern Ireland - but Mr Brown insist they voted on national security grounds. "There were no deals," Mr Brown told a Downing Street media conference. Suggesting the DUP backed the government only because they were offered incentives was "impugning the reputation of people who are concerned about terrorism", added Mr Brown. He went on: "I do not offer deals on terrorism. "I want to take action on terrorism, I wanted to persuade people about the need to take national security into account. "We have received advice from the police and the security services consistently over the last few years that we had to take action on these issues. "Yes, it is right for me to try and persuade MPs from all parties to vote for these measures because I think it is right in the national interest, and I will continue to do so." Mr Brown attacked the Conservatives for opposing the extension from 28 days - saying he believed they would "regret" their actions. "I would still appeal to them and to other parties to join the consensus that we need to take action, to be prepared," he added, after opponents vowed to block the legislation in the House of Lords. He told them: "I do not want to have to come to the House of Commons and tell them that a terrorist incident had occurred but we have not been properly prepared because we failed to take the legislative measures necessary." The Counter-Terrorism Bill faces a tough time in the House of Lords, where Labour does not have a majority. The Tories and Lib Dems have vowed to continue opposing it and they are likely to be joined by a number of cross benchers and prominent Labour peers - setting up the prospect of Parliamentary "ping pong" towards the end of the year as it shuttles between the two houses. Former Attorney General Lord Goldsmith said he would vote against the measure in the Lords, where he predicted it would suffer a "very rough ride". And he accused his one-time cabinet colleague Mr Brown of putting politics before principle, saying his "fear" was that the 42 day issue had "become a symbol of political virility and I think it's too important for that". But the government-appointed reviewer of anti-terror laws, Lib Dem peer Lord Carlile, said the 42 day limit was needed to protect the public against future terror attacks. "Like almost all senior police officers who are involved at the hard end of this dreadful business of trying to protect the public against terrorism, I believe there are entirely predictable and potentially terrible events that could occur in the future for which we should have law ready now. "I am very anxious that the law should be set firmly in place so that we do not have to be hysterically reactive to some event in the future. We need to have laws fit for the future." Ministers insist this new maximum detention period - an extension from the current 28 days - is vital to deal with ever more complex terror plots. But opponents say it will infringe civil liberties and fuel extremism - and they say the police have been unable to provide examples of cases where they needed more time. There was uproar in the Commons when the result of the key vote was announced on Wednesday evening with Tory and Lib Dem MPs shouting "you've been bought" at the DUP benches. They claimed the DUP had been offered inducements - including extra financial help for Northern Ireland - to guarantee its support. Labour rebels said the DUP had also obtained guarantees that the government would block efforts to use the Human Embryology and Fertility Bill, currently going through Parliament, to loosen abortion rules in Northern Ireland. The DUP MP for South Antrim, William McCrea, denied it was promised any financial support and insisted it voted on principle: "The issue was on national security."